The Marketing Outreach Assistant will work with the Communications Team in our Boone, N.C., office to develop and grow relationships with businesses and organizations. The marketing assistant will primarily be involved with The Appalachian Voice, Appalachian Voices’ bimonthly publication, and will work with communications staff to establish advertising partnerships with businesses. The intern will also earn a commission of 20% on new ad sales, provided that is in accordance with any academic credit arrangements. In addition to discussing advertising options with potential supporters, the marketing assistant might also be responsible for ad design under supervision of our communications staff, if he or she is skilled in graphic design. The assistant will also help facilitate distribution of The Appalachian Voice publication, which has a circulation of 61,000, by arranging for businesses, colleges or other organizations to receive regular shipments of the paper and become a distribution points. This position may also work with the publication’s distribution manager to maintain relationships with distribution volunteers. This position will require substantial phone-based outreach and strong verbal communications skills. We are seeking an outgoing, motivated self-starter who is comfortable speaking on the phone. 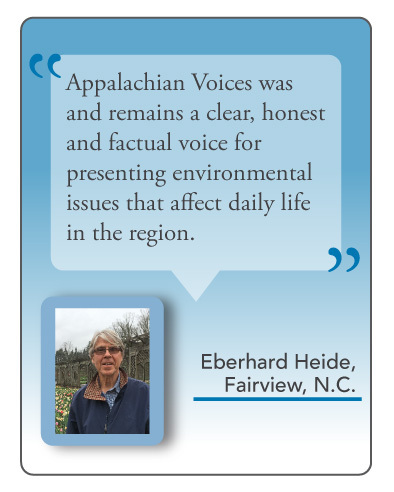 Applicant should also be eager to learn about Appalachian Voices and represent the organization to the public and potential partners. The intern may assist with other communications outlets, as determined by the intern’s interest and the organization’s needs. This may include helping to create promotional materials for the newspaper and Business League, the organization’s network of business supporters. Depending on the intern’s interest and availability, he or she might also develop graphics and text for the organization’s website, e-newsletter, email and social media channels, or write short news bulletins for The Appalachian Voice or Front Porch Blog.